Right from strolling over peaks to jumping on the rocks, trekking can be really fun if done with precaution. This summer, take your friends, take your crazy folks to Himachal and venture out on an exceptional voyage. Blessed with a sprawling beauty, Himachal is the place to enjoy various adventure activities like flying fox, mountain climbing, trekking, motor biking, paragliding, rock climbing, etc. The bleak high-altitude desert terrain inspired Rudyard Kipling to say, ‘Surely the gods live here; this is no place for men’. Here’s a list of top 10 treks in Himachal Pradesh; these trails will take you to extremely remote and ancient trade routes. Whether you’re new to trekking holidays, a casual hiker or a seasoned trekker you will find plenty of expertly planned walks and treks to choose from. A famous mountain pass in Dhauladhar range, Indrahar Pass is located at an altitude of 4,342 meters /14,245 ft above the mean sea level. From the top of Indrahar pass, you can enjoy the spectacular view of the sacred peak of Manimahesh Kailash together with the Pir Panjal Range. Offering the best panorama of snow capped mountains, dense field, etc., this trek passes through the most attractive valleys of Himachal Pradesh. Indrahar Pass Trek follows one of the more established trails used by the Gaddi shepherds en-route to their summer grazing pastures in the upper Ravi Valley and Lahaul. If you’re looking forward to a short break, then Beas Kund Trek is the place to be. This trekking trail passes through the beautiful Solang valley, glaciers, snow-capped mountains and lush green meadows. The trail goes via Dhundi and Bakarthach to enter the Beas Kund glacier, the birthplace of the River Beas. The Beas Kund trek is the most popular and stunning trek in the Kullu valley. 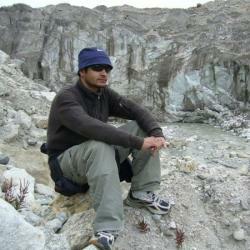 People of every age-group can enjoy trekking here as it is thoroughly enjoyable and easy going. This trek is located at an elevation of 3650 mts. While trekking, you can take in the view of Mt. Hanuman Tibba and Seven Sisters from the Dhundi camp. Mostly referred as Moon Lake, the moment you start trekking here it feels like walking on the moon. This pass is located at an altitude of 4950 m above sea level. Stroll on the ice land and witness the shimmering sunset, lush green landscape, water streams, colorful orchids and various other things that will make your journey beautiful and a trip that you will never forget. While trekking at Chandratal Baralacha, one can enjoy the great view of the high mountains and Baralacha glacier, which is the source of the Chandra River. The trek commences at Batal and heads toward the Baralacha Pass. Throughout the journey, one can enjoy the panoramic view of Lahaul range. This trek passes through various peaks like Mulkila at 6,172 meters, Minar at 6,172 meters, Talagiri at 6,279 meters & Tara Pahar at 6,227 meters. In between the trekking, you can take a short break at Suraj Tal which is a high altitude and sacred lake in the Indian Himalayan region. Lying at an elevation of about 3960 meters, Hampta pass acts as a bridge between Kullu valley and Lahaul. While trekking, you will pass through amazing sights like thick forests of walnut, oak and pine trees, water streams and various villages located within the mountains. Hampta Pass Trek is ideal for all the nature lovers as they can enjoy the beautiful spectrums of nature and remote culture. The level of difficulty will start to increase when you begin the steep climb for Hampta Pass. You will walk on ice and pass through narrow and sticky lanes. The trek will commence at Prini and will lead you towards beautiful landscapes via Solang pass. Trekking on Pin Parvati Pass is not at all easy. It was first crossed by Sir Louis Dane in the year 1884. Located at an elevation of 5300 m above sea level, Pin Parvati trek connects the lush Parvati valley on the Kullu side with the Pin valley on the Spiti side. 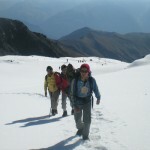 There are immense mountain ranges that form outstanding trekking places. The magnificence of the place draws many trekking enthusiasts from across the world. This trek thrills the tourist with the spectacular view of the Pin Parvati Pass. While trekking, one can catch glimpses of Hindu Khir Ganga, a place devoted to Lord Shiva and wildlife sanctuary Kanwar. Continuous snowfall and rain can make trekking a bit difficult in this area. Amongst all treks, Deo Tibba Trek is the most beautiful. Situated at an altitude of 4480 meters, this trek will take you to the shimmering water of the Chandratal Lake. While trekking, you can enjoy the stunning side view of Rohtang pass and various other hanging glaciers. Deo Tibba Base trek in the Beas Valley is famous for its flower covered meadows, terraced fields of apple, paddy, maize and of course the sparkling Beas river. Deo Tibba Trek is located amidst several other mountains i.e. Rubal Kang, Manirang, Leo Pargial, Rangrik Rang, Hanuman Tibba, Manimahesh Kailash and Gumburanjon. Sited at an elevation of 3300 meters, this breathtaking trek is located in Kangra district. 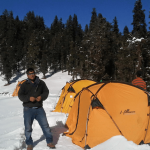 Kareri Lake Trek starts from McLeod Ganj and will lead you towards Kareri village. On your way, you will witness a grand temple on a hilltop overlooking the lake which is dedicated to Lord Shiva and Shakti. Kareri Lake is another main attraction which is formed by the inflow of melted waters from the Mankiani Peak. 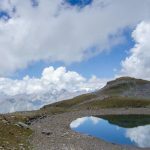 The Kareri Lake trek being one of the alpine treks in the Indian Himalayan region is recommended for experienced trekkers who have prior experience of high altitude trekking. Walk through the remote and isolated areas of Himachal Pradesh. Shepherd trail, locally known as Gaddi trek, connects the rich and the pictorial valley of Kullu & Kangra. The trail passes through various snow capped mountains like Khanpari pass at 3,600 meters and Thamsar Pass at 3,500 meters. What make this challenging trek are the tricky tracks and slippery rocks. 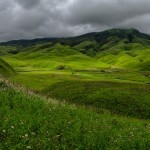 The trail is enriched by several alpine woodlands and meadows, wild animals and colourful orchards and gushing streams. The trek commences from Manali and ends at the Kangra valley. 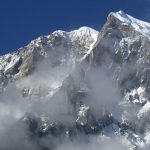 It is considered as the longest trek in Himachal Pradesh and travellers will have to pass through difficult elevations every day. Located at an altitude of 8468 feet, Bara Bhangal trek is the most challenging trek amongst all the terrains in Himachal Pradesh. Bara Bhangal Trek is an alpine terrain between Kangra, Chamba and Kullu valley. This trek offers the best view of Western Himalayas. This trail will take you through different altitudes and crosses several high mountain passes. You can capture the magnificent views of peaks like Indrasan, Deo Tibba and Hanuman Tibba. 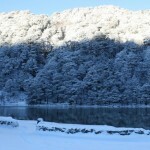 The evergreen valley is dotted with alpine forests and shelters various birds and animals. The Bhabha Pass Trek is more than what you can imagine. If you are an ardent admirer of mountains, the Bhabha Pass Trek is surely going to be unpredictable at every stretch and turn. While trekking, one can witness various buildings like Kungri Monastery, Ki Monastery and Tabo Monastery. Located at an elevation of 4,865 meters, this trek starts from Kafnu. The trail passes through one of the most impressive mountain areas of the Himalayas i.e. Hansbeshan peak. Mesmerizing background of the historical monuments en route makes it one of the scenic treks in India. The above-mentioned trekking trails will reward you with a lifetime experience. Choose from any of these stretches and enjoy your holidays in an offbeat way.